Here is a great article from Kitchen Sync about the details of wood and its characteristics in kitchen cabinets. Excellent information for anyone thinking about a kitchen renovation and for people like us who know nothing about cabinets. We know stone, but wood is a whole different animal. That is why we always keep an eye out for good information that we can pass along. Kitchen Sync is another excellent blog that we recommend. Kelly Morisseau is a Certified Master Kitchen and Bath Designer and a Certified Interior Designer. Her blog is overflowing with great ideas, smart ways to solve problems, and excellent advice that you can only get from a person who has an extraordinary amount of experience and training. Kelly has a tip for people who don't want any natural variations in their wood cabinets - either be prepared to pay extra or go with something else. As she says, "The beauty of wood is in its characteristics." "Pick stone with no holes at all." "Choose only lighter colored tiles." "Pick a combination of shades of off white and beige colors with a preference towards the beige." Yup. That last one is for real. We do everything in our power to give someone what they have requested and our regular practice is to reject tiles with significant holes, cracks or chipped edges. But if you know you are too OCD to handle the inherent tumbled edges, shading variations and small imperfections - natural stone tiles are probably not for you. It's okay to admit it. There are plenty of ceramic tiles* to choose from. Our Grape Harvest mural on 6x6 Light Travertine is a good example of how the natural variations in the stone enhance the beauty of the warm, rustic artwork. *We do have a way to put our designs on ceramic or porcelain tile, but we use an outside service and the lead times can be 2-3 months out. It is not something we have added to our main product line, but we can do special requests. The lead time on our natural stone products is 2 weeks in production and then it is out the door. Kitchen picture at the top is courtesy of Bartel Kitchen & Bath in Buhler, Kansas. We just received a picture of this beautiful kitchen from Great Britain Tile. They used the Minore Antiqued tiles in the Charcoal/Green color as the focal point for the backsplash. The tiles are printed on our 6x6 Light Travertine stone. The Minore Antiqued is a very subtle fusion of color and patterns. It is not a design which jumps out at you. Instead, it hints at something old and timeless. It lingers and slowly unfolds its many turns and mysteries; like an ancient Grecian city or a pathway through the old town of Tangiers. What do you think? Would you pick circles or squares? This week we held our first Custom & Design Program Webinar with some of our Authorized Dealers. We presented all of the options available to create custom tiles and shared pictures of some of our custom tile projects. Our Custom Program is actually not very complicated. We can make changes to any of our designs or work with customer-supplied artwork to create a truly personalized tile. We have a great deal of flexibility and options since we always start with a digital image. See more information about our Custom Program here. A Celtic pendant was used to create a custom tile from our Amaretti Dawn design. We have been embracing technology recently and love how it can keep us connected. Our webinar brought us together with people all the way from Merrimack, New Hampshire to Santa Barbara, California - and lots of places in between. The dealers around the country who carry our product lines have proven to be a smart and committed bunch of people. They are always looking for opportunities to improve their knowledge so that they can better serve their customers. They always impress us. Dealers have full-size, in-store samples. You can browse the beautiful pictures on our website, but there is nothing like seeing the tiles up close and personal. Touch the natural stone tiles to feel the texture and weight of the stone. Look closely at the detail and colors in the artwork and the shading in the stone. Taste and smell the tile if that's your thing. (Please bring your own antibacterial wipes.) Seeing the full-size samples will give you a much better idea of what the StoneImpressions tiles will look like in your home. One of our Floor Tile Sample Boards featuring the Clermont design. Clermont also looks great as a kitchen backsplash. Dealers are trained. They can answer your questions and they might even have a few questions for you to help you determine the best way to approach your home improvement project. They have experience working with StoneImpressions and will be able to make recommendations about other items that you might need - grout, cleaner, adhesive, or the phone number of a good tile installer. Dealers are a part of your local economy. They employ your neighbors, contribute to the local tax rolls and have a vested interest in your community. Nobody likes to pay taxes, but wouldn't you rather have your money stay in your own backyard? Especially in this economy, shopping locally supports your community in a very tangible way. One of our full-size (24" x 30") sample boards featuring our Dolce Casa tile mural and Regatta listello. Dealers can assist you in other ways. We do one thing - decorative natural stone products. But our Dealers can help you with other aspects of your home improvement project. Some have Certified Kitchen Designers on staff, like DJ Dietz Designs in Reedsburg, Wisconsin. They can help you with your total kitchen remodel from planning and design, all the way to installation. Other Dealers carry a wide variety of products including kitchen cabinets, sinks, appliances, marble countertops, bath and shower fixtures, and all types of flooring from carpeting to hardwood. We are always happy to talk to you when you call. But when you want that fabulous face-to-face customer service experience, you can find an Authorized StoneImpressions Dealer by going to the Showrooms page on our website. Kitchen display in the DJ Dietz Designs showroom. Our previous entry showed off the tiles in our Herb Collection. As much as we love these pretty tile accents, you can't eat stone. Or drink it for that matter. For today's fun Friday distraction, let's look at some fabulous ways to use real-life, aromatic, fresh and tasty herbs. Over at The Nibble they have some interesting recipes for Herb Infused cocktails using tarragon, basil and rosemary. The Shinnecock Cocktail features rosemary, peaches and rum. Sounds divine! Is it five o'clock yet? You can't beat The Pioneer Woman Cooks for drool-worthy recipes with gorgeous photos and easy to follow step-by-step directions. 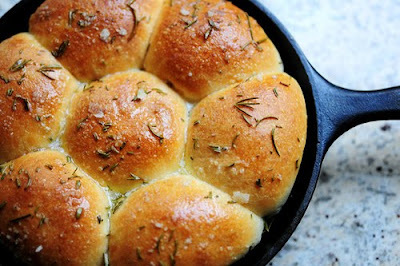 Try her Buttered Rosemary Rolls or Sweet-Roasted Rosemary Acorn Squash Wedges. Mmmmmmmm. We hope they invent Scratch-n-Sniff web pages soon because the aroma is probably twice as tempting as that photo. Remember Snow Cones? The make-your-teeth-ache, syrupy sweetness that you loved as a kid? Well now there are more to Snow Cones than your summer flashbacks of sticky hands and fructose-induced mania. How does Blackberry Lavender sound? Or Watermelon Basil? 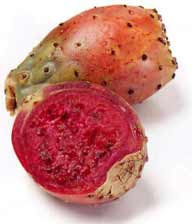 Lemon Prickly Pear?! 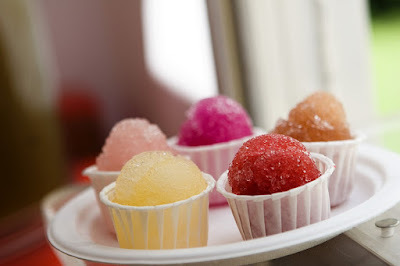 Linday Laricks and her Fresher than Fresh Snow Cones offers these flavors and more. Selling to the lucky folks in the Kansas City area from her vintage 1957 Shasta trailer, she uses all natural ingredients and sweeteners, along with fresh fruit and herbs grown in her own organic garden. She only sells these refreshing treats during the summer (yes, we are way behind) but we hope she will consider hauling that trailer of hers over to our neck of the woods for the winter months. What do you say, Lindsay? San Diego is calling... endless summer days, beautiful beaches, all the fish tacos you can eat? It's 70 degrees and sunny today. How about it? Whether you are snuggled up against the cold this Friday or sporting your tank top and flip flops - have a great weekend everyone! Our Herbs Collection has proven to be an undeniable favorite for kitchen backsplashes. The pretty bundles of herbs - Sage, Basil, Rosemary, Oregano, Peppermint and Chives - are fresh and cheerful. These kitchen backsplash tiles will awaken memories of your summer garden, in all its blooming glory, even through the coldest winter. This kitchen is a great example of mixing material - natural stone tiles with multi-colored ceramic tiles. The Herbs artwork was derived from the works of Annie LaPoint, a California artist known for her rich watercolors of fruit, flowers and topiaries. You can see more of Annie's art at Penny Lane Publishing. Some of the designs in our American Country Collection were licensed from her work. and trimmed with Pencil and Rope Liners. The Herb Accents can also be used alone, to add a simple flourish of beauty to the otherwise boring backsplash tile that runs underneath the kitchen cabinets. We truly can not do justice to the Herbs Collection without showing you a close up picture so you can appreciate the beauty in the details. Go ahead...click on the picture below and soak up the charm. You can see all of them here - Herbs Collection. We have other designs and layouts in our Kitchen Backsplash Design Ideas booklet. A great place to browse for inspiration.